Giving farmers an alternative to poaching is another major component of the Nsefu Wildlife Conservation Foundation's mission. Farmer's trying to generate income from crops grown on small plots of land can be justifiably upset when crop raiding elephants encroach upon their farms. Nsefu.org would like to thank Evan and Erin of Bud's Louisiana Cafe for helping us start this amazing project? Beehives are being built by Team Nsefu and beekeepers and being deployed throughout the region. The locals are fully engaged with becoming beekeepers and are learning how to build and maintain their own hives. Beehive fencing is being built in crop areas vulnerable to human/animal conflict. Beehive fencing is an excellent way to divert wildlife AWAY from crops and gardens." $1,680 to compensate villagers to help oversee implementation. Elephants naturally avoid honeybee hives. They know a swarm of bees attacking a baby elephant can kill it. Unlike their American counterparts, African bees sting multiple times and their venom is more poisonous. The placement of beehives creates a "natural fence" that keeps elephants away from village crops. 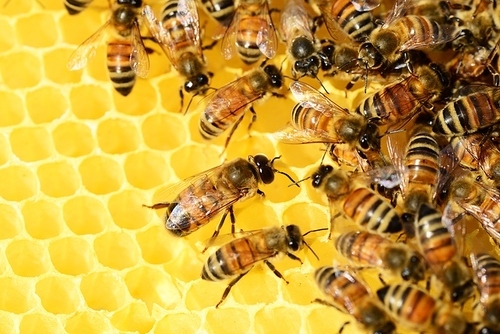 Honey and other hive by-products provide an income source.